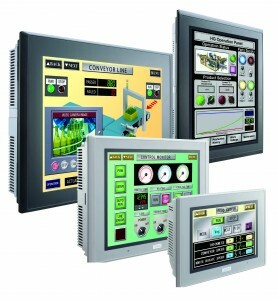 Each of these touch screens have super-bright displays and many features and functionalities including a Web Server function, FTP Server function and the ability to support multiple protocols simultaneously allowing you to connect multiple devices to a single HMI. 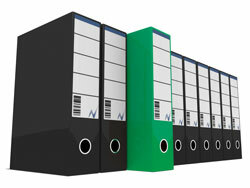 Communication drivers are available for many PLC manufacturers including Siemens, Allen Bradley, Mitsubishi, Omron and many more, so connectivity will not be an issue. There are many communication options too as the HMIs have an Ethernet port, RS232 & RS485 ports. Supporting Modbus RTU (RS485) and Modbus TCP/IP (Ethernet) as an open protocol solution, the HMIs can also talk directly to variable speed drive (VFD), inverters and other devices. The super-bright 4.3” HG1G TFT LCD series of touchscreens offer a high resolution of 480 x 272 pixels, and a vivid 65K colour display with a brightness of 800cd/m2. With most of the features and functionalities found in a larger screen, including remote monitoring and control and an FTP function, HG1G also supports multiple communications – up to four protocols simultaneously – and has a best-in-class LED backlight life of 70,000 hours! This provides many years of operation, as the life is extended by a backlight that can be automatically switched off when the unit is not in use. HG1G touchscreens can also be mounted with the screen orientation set to portrait or landscape mode depending on space requirements. It’s flexible and small enough to fit in a tight space, and priced to fit a tight budget. This NEW super-bright HMI supports FTP communication and multiple communication protocols – up to four protocols simultaneously. Built-in web server IIoT (Industrial Internet of Things) functionality allows browser-based remote access from any internet-connected device, at any time. The HG1G HMI is programmed using WindOI-NV4 software, part of the Automation Organizer suite. IDEC WindOI-NV4 software is easy and intuitive using drag-and-drop functionality and a built-in library of over 7000 images. The High Performance series of touchscreens are high definition TFT LCD displays with resolution of SVGA 800×600 pixels (8.4” to 12.1” display) and VGA 640 X 480 pixels (5.7” display) . With 65,536 available colours to provide realistic images and the brightest displays in the market these screens provide clear, sharp and bright displays even in environments with low light. In addition to the remote access capability of IDEC HMI Touchscreens and PLCs to upload, download and use Pass through programming via the Ethernet, you can now remotely monitor and control IDEC OI Touchscreens with a web browser on your computer, tablet or Smart phone. This is an efficient way to remotely troubleshoot, test and do maintenance regardless of your location. Whether you are vacation or at your office thousands of miles away, less time and money spent on travel expenses is savings in your pocket. 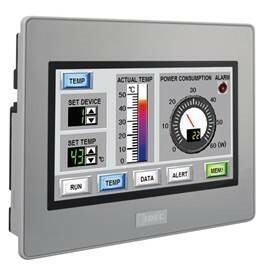 Depending on model size, up to 4 MicroSmart expansion digital I/O modules can be mounted on one HMI Touchscreen , eliminating the use of a PLC and saving space in the panel. This also means that the project programming can all be done in the operator interface utilising parts and scripts to do simple I/O control.